An AC Petite 3 wheeled Microcar with a rear-mounted 350 cc Villiers single cylinder two stroke engine. It had a single bench seat for 2 adults, and was claimed to do between 60 to 70 mpg with a max speed of 40 mph, sent in by © William Marsh. 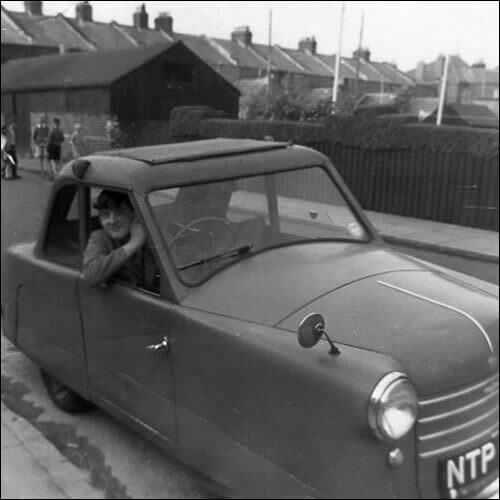 During the early 60's, I owned this 3 wheeled vehicle and used to drive it from Portsmouth to Kent when on leave. It had a 2 stroke engine in the rear with column gear change (and no Heater). I had a 1954 (?) AC Petite in 1962. Fawn in colour. It had a 350 cc Villiers single engine in the back. The final drive was via 3 V fan belts. The motor cycle gearbox was connected to the gear lever by a rather complicated linkage of rods. It travelled at 35 mph easily. It had a sun roof. By removing the fibre board above the rear engine I could service it from inside the car, leaning over the seat back (in the rain!). It had no reverse but easy to roll back manually. Drove it on a M/C licence. Great first car as a teenager.